A well stocked pantry is comforting. No matter what is going on around us, there is always something to eat and that is the best security a family can have! We’ve had a lot of practice in keeping a well stocked pantry and detail these methods in Stock a Pantry like a Pro and Eat Really Well on a Tight Budget. 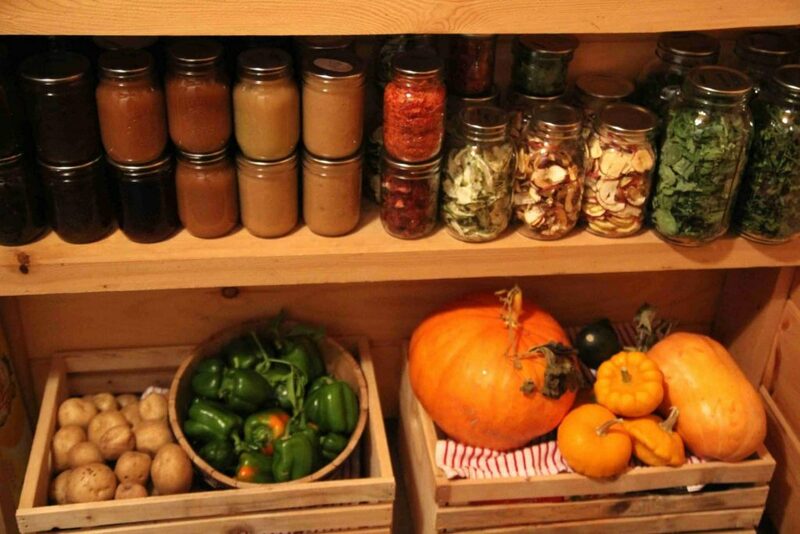 Here’s what the homestead pantry looks like this year. 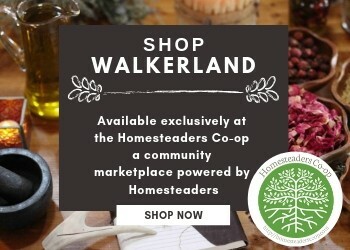 Included are details on the different ways we store food, links to recipes and some inspiration for your own pantry. We are fortunate to have a seemingly endless supply of wild apples. We also discovered “rejected” apples for sale freshly delivered from a local orchard for CAD $12 per bushel. These are really nice apples, much nicer than the ones we forage for. You can make a lot of different things using apples. 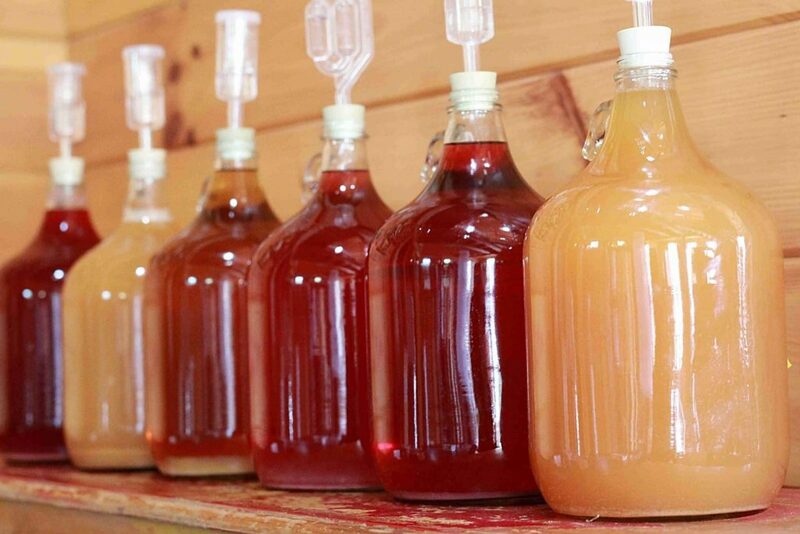 Pictured here (left to right / back to front) Hard apple cider, fire cider, apple cider vinegar, raspberry apple cider vinegar, Soft apple cider, apple butter, dehydrated apple chips, apple & fig chutney, apple wine, apple sauce & apple juice. 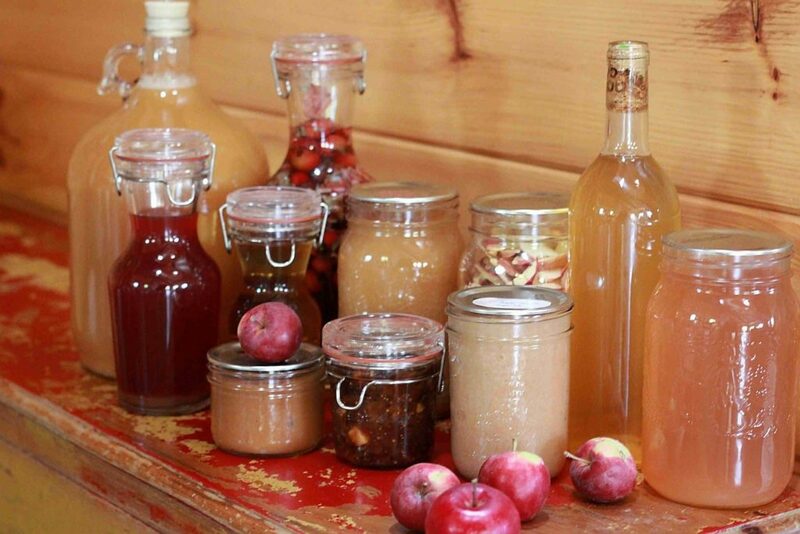 If you are looking for recipes here is a great article that shares 9 Ways to Preserve and Use Apples from Pioneering Today. Dehydrating is an easy way to preserve nutritious food. Every week we dehydrate trays of kale and spinach. These plants produce new leaves all summer long if you keep cutting off leaves. You can leave them whole to toss into soups or grind it up into a fine powder. The powder is an excellent way to sneak nutrition into dishes for picky eaters. Apple chips are a quick & healthy snack. nasturtium leaves add a slight peppery seasoning to your cooking. Dehydrated zucchini and tomato skins are a great way to make use of excess produce and there’s nothing better than dried berries with oatmeal in the wintertime. Here are instructions for drying your leafy Greens from Joybillee Farm. Country wine has become a bit of a hobby. It’s fascinating to take an ingredient like parsnips and turn it into a nice dry white wine (parsnip in particular has been known to knock a persons socks off). This years varieties include: Raspberry, blackberry, rhubarb, rose hip, rose petal, birch, parsnip and carrot. Here is a great parsnip wine recipe from the Guardian in the UK. I should note that they use bananas in their recipe and we excluded them from ours. It turned out really well. This old greenhouse rack is 7-8 jars deep and holds a lot of food. The jams and jellies and other canned goods are organized in rows by flavour. This layout provides a good visual of when stock is running low. There’s also large containers & 5 gallon pails filled with bulk dry goods such as flour and sugar. A lot of this gets vacuum sealed to preserve the freshness for even longer. 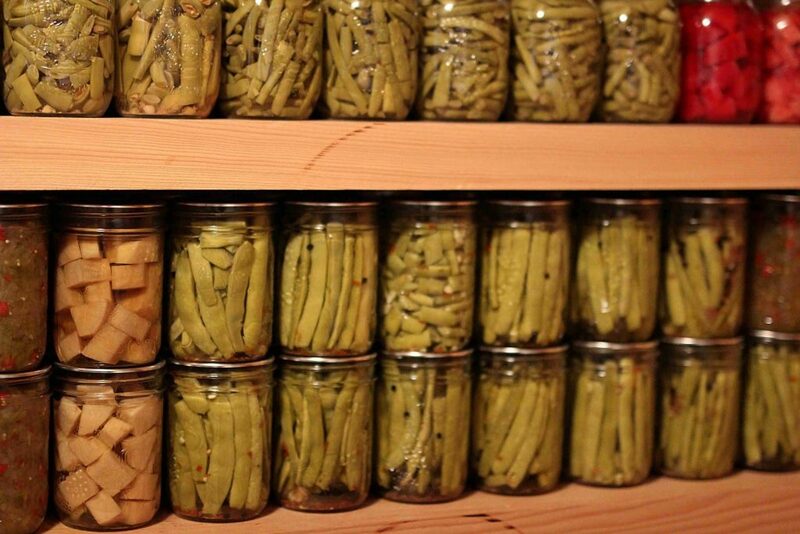 We refill bulk items into smaller more manageable jars as needed. Special jams and jellies are great for saying thank you or for gift giving. If you want to learn more about the special methods we use to make jam you might like reading Simple Techniques for Creating Artisan Jams & Jellies and here’s our recipe for Strawberry Rose Jam and Raspberry Jam with Kirsch. We grow and dry a lot of herbs for culinary and medicinal uses. We’ve also started drying different roots and flowers. With so many herbs growing in the garden we can liberally use them in our cooking, skincare and natural remedies without concern for cost. 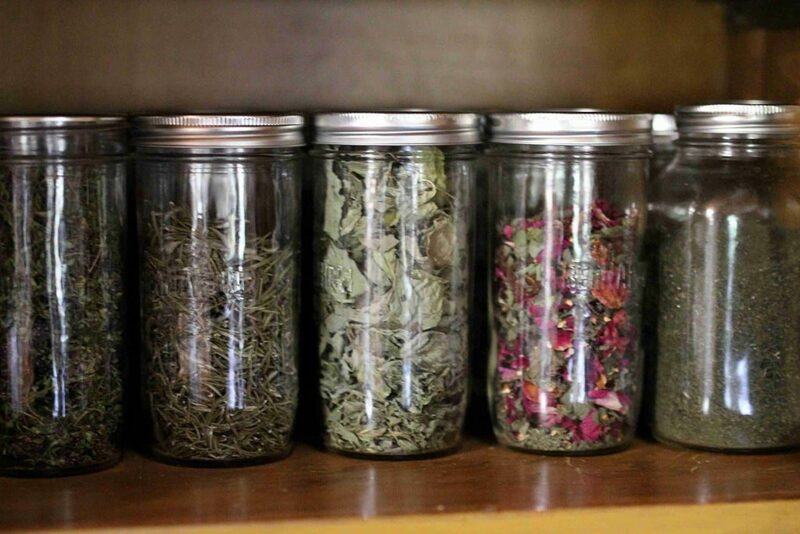 We found this guide to herbal teas from Mountain Rose Herbs to be really helpful. We put up over 350 jars of home grown vegetable and fruit preserves so far this year. Some of our favourite recipes include: Plain Beets and Plain Carrots and these pickled carrots with ginger and dill are delicious. We prefer fresh vegetables but home canned goods keep us fed into late spring when the garden is just starting to produce again. Most of the garden is packed away by mid October in our zone 4 climate. We fill the pantry with boxes of green tomatoes, squash, potatoes, onions, garlic and Jerusalem artichokes. Root vegetables such as: carrots, beets and turnips are kept in the garden until just before the ground freezes (mid November). This year we are going to try our hand at overwintering carrots, parsnips and beets. We were inspired to try this after learning about it from Northern Homestead. 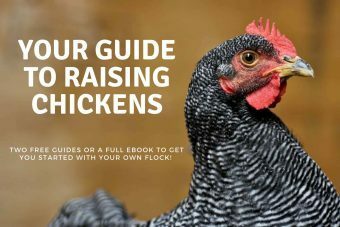 The hens always start their moult in October and soon after that winter arrives. 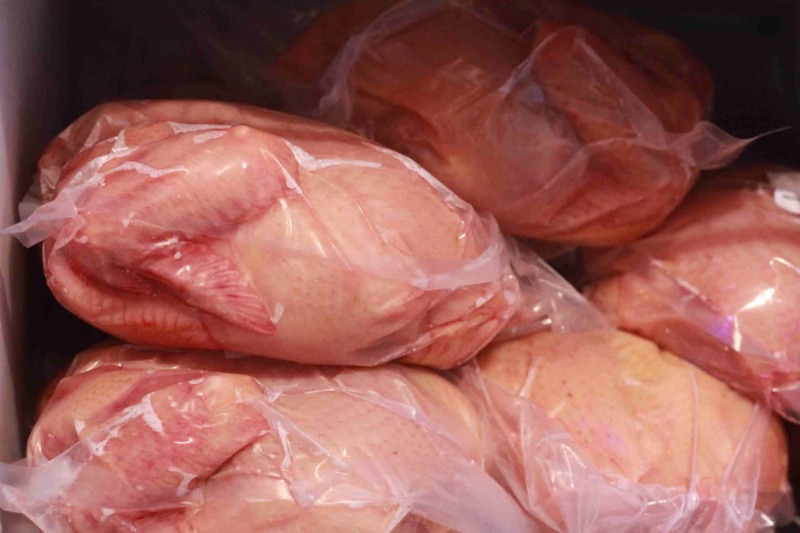 This means egg production dwindles dramatically from October until spring. we keep a few months of eggs stored in the fridge. 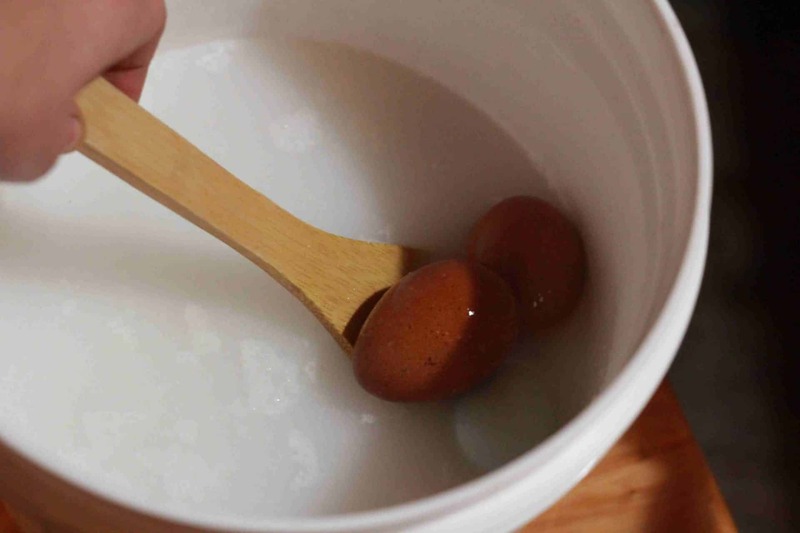 We are also trying an old fashioned method of preserving eggs called water glassing. You make a mixture of purified water and hydrated lime and place fresh, unwashed eggs in the solution. The hydrated lime mixture will keep the eggs fresh for six month or longer. The freezer is a modern convenience that we appreciate. It is packed full of our home raised chicken plus the remaining pork from last season and plenty of vegetables, berries and butter. We freeze bags of vegetable scraps and peelings. They make an excellent mash for the hens and stock for soup. We also freeze jars of roasted cherry tomatoes in olive oil frozen as well plus ham bones and lard. 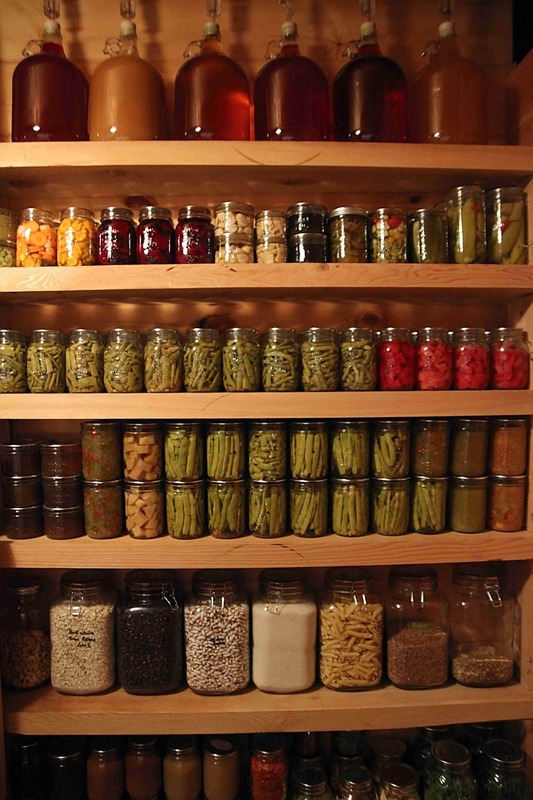 Keeping a well stocked pantry provides us with peace of mind. 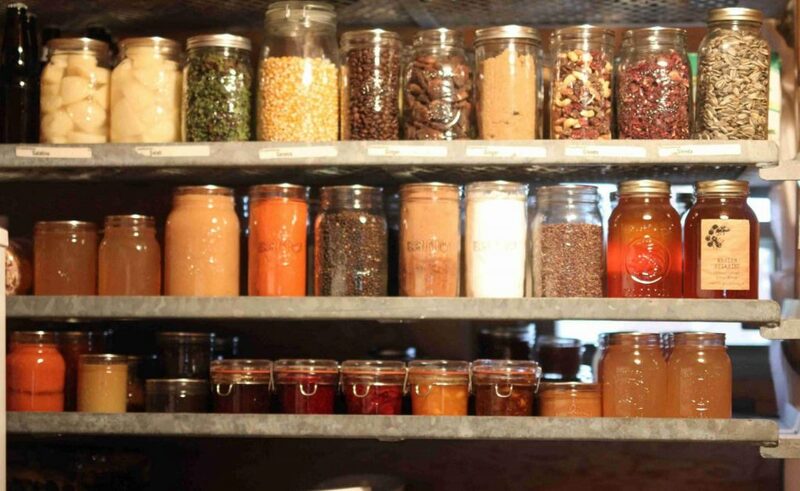 A pantry saves time and money and will encourage you to cook from the ingredients you have on hand. Less trips to the store. Less time spent on gathering food. It’s worth it I promise you! 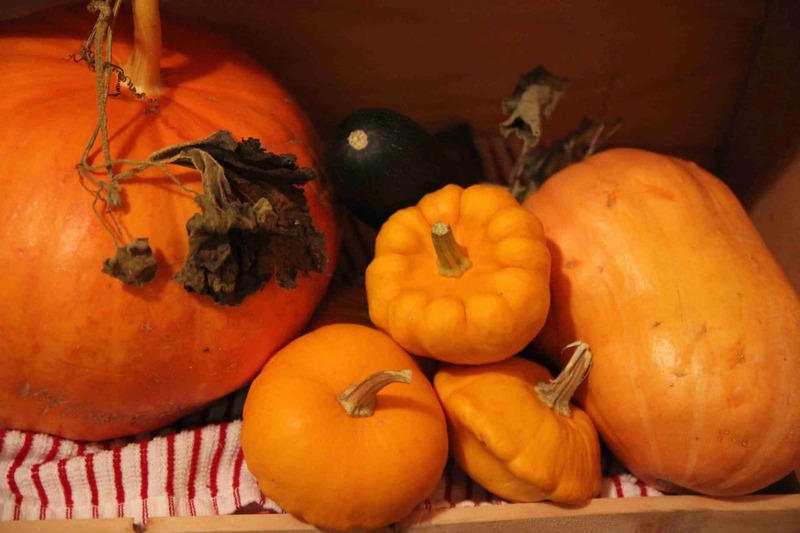 I would love to hear how you use your pumpkins! I typically toast the seeds and tools the rind to the chickens..
Hi Shannon. It really depends on how many pumpkins we have. This year we had five small and one big one. We carved a jack-o-lantern with our niece and toasted the seeds. The flesh that I scooped out will be turned into a purée that I freeze for pumpkin pie, bread or other winter treats. I personally like savoury over sweet and love oven roasted pumpkin as a side dish spice with nutmeg, salt, pepper and butter!